The fourth instalment of the Mission Impossible films is simply fantastic and exceeds the dimensions and downfalls of the last two Mission Impossible films. Directed by Brad Bird, Tom Cruise returns as IMF agent Ethan Hunt whose tag line “this is your mission should you choose to accept it”, takes special agent Hunt from the Kremlin in Moscow to the tallest building in the world, the Burj Khalifa in Dubai to a fantastic 007 sequence in Mumbai complete with seduction, missiles and a superb action sequence. While Mission Impossible 3 featured Philip Seymour Hoffman as the elusive villain and was a much more bloody and heart pounding film with chase sequences in Berlin and Shanghai, it is Mission Impossible: Ghost Protocol that shows that while Tom Cruise might be getting older, he certainly has not lost his touch as one of the quintessential action film stars of the last three decades. 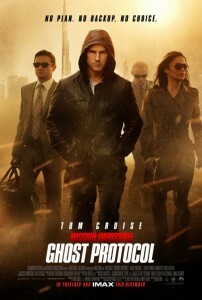 In Ghost Protocol this is helped by a more robust and slimmed down supporting cast including Jeremy Renner from The Hurt Locker and The Town, Paula Patton, Simon Pegg and Michael Nyqvist as the villain from the Swedish films of Girl with the Dragon Tattoo. Mission Impossible: Ghost Protocol is fabulous for the spectacular stunt sequence at the Burj Khalifa and the Dubai sandstorm car chase while the Mumbai automated car storage sequence and is definitely a homage to all the hugely popular James Bond franchise.